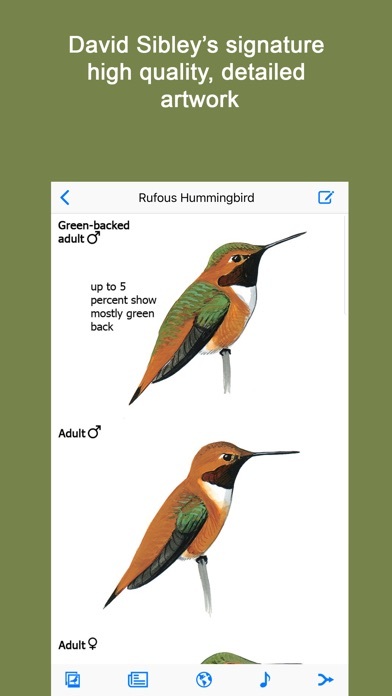 Sibley Guide to Hummingbirds is a section taken from the new Sibley Guide to Birds 2nd Edition. It is fully functional and allows you to try out the app for free. Features include: •	An easy to navigate menu system on iPhone. •	A new grid view with larger thumbnails. •	Display species names in English, French, Spanish and Latin (Scientific). 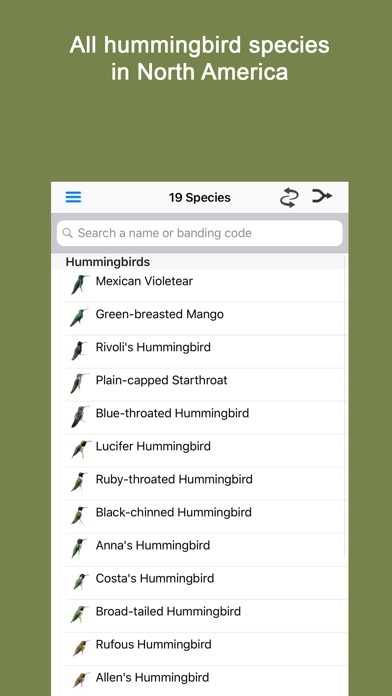 •	Search on banding code to quickly find a species. •	Calls/songs covering most species. •	Compare 2 species side by side. 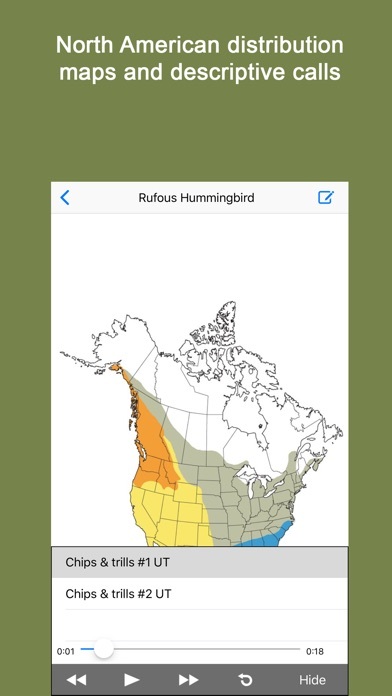 •	Apply a location (US State or Canadian Province) to narrow down the list of birds. •	When a location has been selected, a status icon will appear next to each species in that location indicating whether it is Common, Uncommon, Scarce, Rare or Vagrant. •	Detailed information in the species description including location status by month. 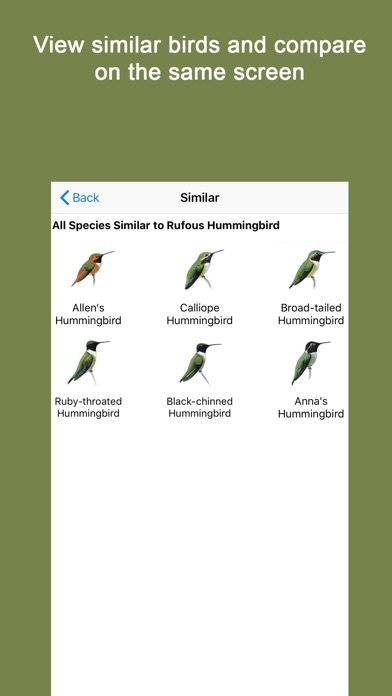 •	A similar species feature which shows all related birds. 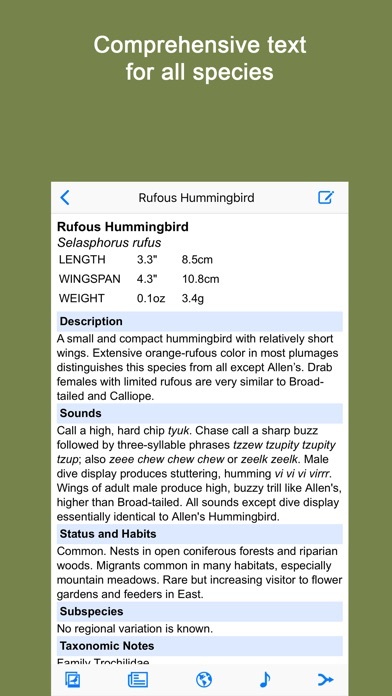 •	A vastly improved Smart Search with refined search criteria: Status and by month (when a location is selected), Bird habits, Bird Type, Bird Size, Body Shape, Color and Pattern. •	Keep a personal list (My List) of species seen and backup to iCloud/other cloud service. •	Sort My List taxonomically.